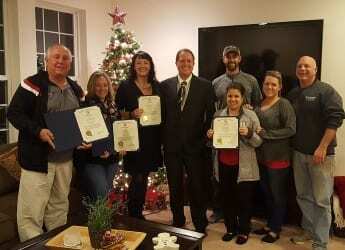 Baltimore County Councilman David Marks on Friday honored nine local volunteers as Fifth District Citizens of the Year. Eight of the recipients are members of the senior leadership team for Angel Park: Paul Amirault, Judi Coleman, Andrew Hacke, Jackie Hacke, Michelle Yeager Streckfus, Jolene Dambeck Sosnowski, Laurie Tice Wagerman, and David Dunstone. They, along with past recipients Kelli Szczybor, Dennis Hoover, and Bill Paulshock, helped lead the community build this summer that resulted in this playground and amphitheater. Councilman Marks also recognized Peggy Winchester, President of the south Perry Hall Improvement Association, for her work improving building standards in the White Marsh area of the Fifth District. “Peggy has been a tireless advocate for her community,” Marks commented. The Fifth District Citizens of the Year program has honored outstanding volunteers since 2011.